Enfants du Mékong supporters at the “20km de Paris” race in 2012. That’s were Antoine and I noticed their involvement in sports! Hello all, I would like to present you a project that we have with a friend: that of competing at Ironman France in June 2013 and – more importantly – raising funds for an NGO called Enfants du Mékong (Children of Mekong). Enfants du Mékong is a French NGO that focuses on helping the youth in South-East Asia, mostly by allowing people to sponsor a child’s education, but also by supporting local development projects like building schools (see map below in this post). We will participate in the financing of a pre-school in Bou Sra (Cambodgia) which costs 13,500€ to run for 3 years. The more we collect, the easier it will be for Enfants du Mékong to set up the school there… I’d like you to help us achieve our funding goal! It’s a personal challenge that goes far beyond what we’ve ever done sports-wise, but it’s also the nothing-is-impossible-type of challenge that make you grow as a human being. In order to do good not only to ourselves, but also to others, we tied to a social cause. We’ve decided to partner up with Enfants du Mékong and to try to raise as much money as possible to finance the construction of a school in Bou Sra, in Cambodgia (13,500€) (first, we wanted to do it with the Ironman Foundation, but they only set up partnerships in the U.S. so we decided to go for a local, French NGO). Enfants du Mékong has a fundraising program called Défi du Mékong (Mekong Challenge) which allows amateur athletes to raise funds around a sporting event. We will be participating in the financing of one particular project: the installation of a school in Bu Sra, on the border to Vietnam. 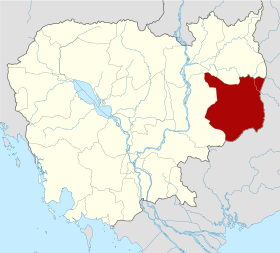 Bu Sra is a small village situated in the province of Mondolkiri, and the people who live there are called the Phnongs. The Phnong tribe has long been marginalized and, even if the economic situation is improving at the moment, there is still a lack of resources when it comes to education. All you need to do is to go to our fundraising page on Alvarum and to donate whatever amount you like. You’ll see that we’re at the very beginning of our fundraising effort, but as time goes I’m sure you’ll help ud grow the pie! On our side, we’ll also give money and, of course, start training. Thank you! Thank you for your contribution!!! Next Post → Where do creative crowdsourcing participants come from?